You use here to access the Preferences. You can also Log On and Off, depending on what is on view, each of the services. 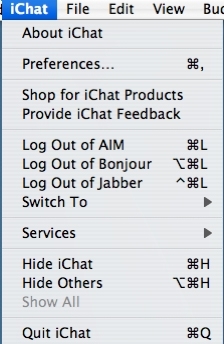 Only one account of each of the Jabber or AIM types can be (potentially) logged in. The "Switch To..." item allows you to switch between different valid AIM Screen Names or Jabber IDs. The "Provide iChat Feedback" is a link to an Apple page where you can give information to Apple include 'Wish List' stuff as it has a free text box. You can of course use the Menu to Quit iChat. Picture 1 of the Menus of iChat 3 - the Application Menu.